Born on November 9, 1841, Edward became King "of the United Kingdom of Great Britain and Ireland and of the British Dominions beyond the Seas" following the death of his mother, Victoria, in 1901. Because the Dominion of Canada had no mint at that time, the portrait dies of the new monarch were prepared at the Royal Mint in London. This stately effigy was used on all Canadian coins (except the gold sovereign) from 1902 to 1910. Edward was depicted in profile wearing the imperial crown, and robe of state with the collar of the Garter and the badge of the Bath (the insignia of two of England's highest orders). 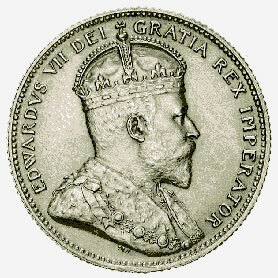 Surrounding the bust is the legend EDWARDVS VII DEI GRATIA REX [ET] IMPERATOR (Edward VII, by the grace of God, King [and] Emperor). This portrait, one of many prepared for the coins of England and her colonies following Edward's accession to the throne, was designed and sculpted by George W. DeSaulles, Chief Engraver to the Mint at London. DeSaulles, whose initials appear below Edward's portrait, received his early training in art at the Birmingham School of Art. He then did apprentice work in both Birmingham and London before assuming his post at the Royal Mint in 1892. In this capacity, he prepared many dies for coins as well as for official and private medallions until his death in 1903 at the age of 41. This coin forms part of the National Currency Collection, Bank of Canada.